Strong women in films, female actors driving a film – Director K.Balachander was a pioneer here, much before it became trendy to create such films. A titan in the world of South Indian theatre, film and television, K.Balachander proved, over and over, that a hero is not the only strong point a movie can pivot on. The men are not the only ones that keep the box office ringing; ‘KB’ as he was known believed that women were equally capable of shouldering the immense weight he gingerly placed upon their slender shoulders. The women in his films were bold enough to define and defy life’s many callings. This achievement which remains unmatched is his legacy; a legacy that doesn’t merely tend to the trappings of commercial cinema but answers the more pertinent question of what cinema can achieve. Nobody before and clearly nobody after has dared go to the corners that he so boldly walked through. KB is credited with having introduced many stars – a galaxy if you will. Superstar Rajnikanth was cast as a long lost husband in Apoorva Ragangal. As if KB was already aware of the heights this man would scale, his debut scene had Rajnikanth kicking the gates open. The rest as they say was history. It was not just this insight but his audacious choices in casting that kept the audience rooted to the spot. 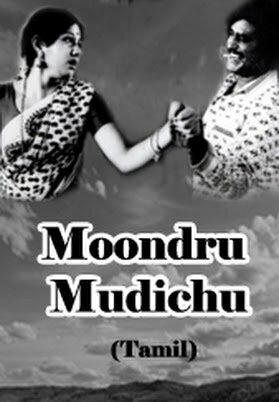 In Moondru Mudichu, he did not let the heroine succumb to the cynicism of the villain. Instead, she saw through his ruses and taught him a lesson in the bargain. 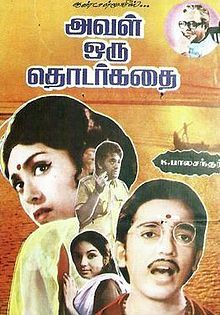 This was something Tamil cinema was not accustomed to. In Arangetram, the eldest daughter of a pious Brahmin household is frustrated by the iron clasp that poverty has over her family. She takes to prostitution to solve this and in the end her family throws her out. Does she lead a happily ever after life? Of course not. His stories mirror life closely and life is often bitter and seldom sweet. Here was a man who was a visionary, a feminist – one who was eager to break through the glass ceiling, whose thirst remained unquenched even after eons of filmmaking. K.Balachander was one of the very few filmmakers who was not reluctant to cast debutantes in challenging roles. His confidence to extract noteworthy performances from them was remarkable. Sujatha in Avaloru Thodarkathai is the scapegoat of her family. She works hard so she can feed their hungry stomachs. Sacrifices land on her neck like sickles. Does she cower? Crib? Or seek sympathy? It would have been easy to choose any one of these but KB wanted his heroines to stay strong. Even in the face of countless adversaries he did not want them feeling sorry for being female. This enduring love and pride that reflected in his female protagonists is what makes this man’s movies inspiring and riveting. In Unnal Mudiyum Thambi, the gardener of the house who is also an aging man plants a sapling every day. When questioned, he simply states that every man should leave behind something that is of benefit to the future generations. He was a simple gardener and what else can he leave behind other than these trees? He would be long gone but the fruits of these trees would be cherished by the progeny. KB could well be speaking for himself. K.Balachander was a simple entertainer. But his movies scorch your soul and set fire to your long held beliefs. That is how we will remember him; as the man who put forth contentious questions and was never afraid of the answers. I think director Balachandar played a great role in bringing the woman of the modern world as sung by Mahakavi Bharathi in front of our eyes. The role of Suhasini in Sindhu Bhairavi and Manadhil Urudhi Vendum were unforgettable. Good post! Balachander’s TV serials were also quite thought provoking, and displayed women empowerment!